When Nian Wang pieces together sequences of genes, he hopes to make citrus varieties that are more tolerant to the deadly disease known as citrus greening, which has devastated a multibillion-dollar-a-year industry in Florida. 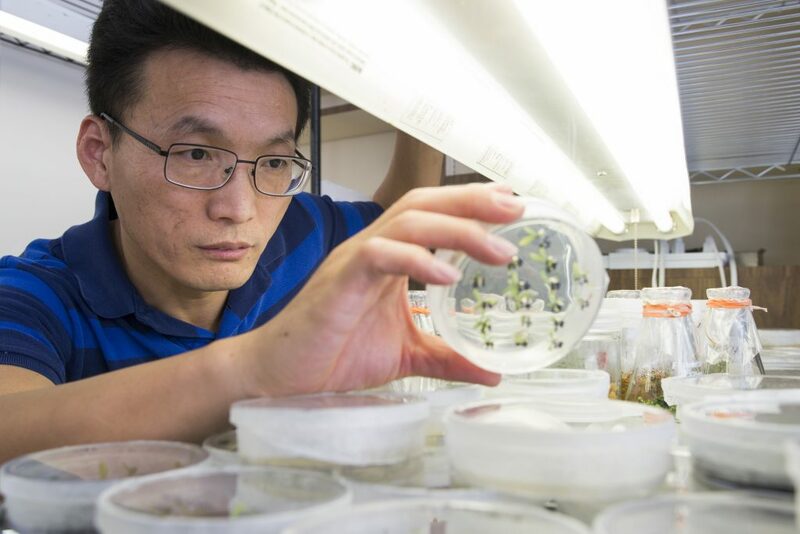 Wang, a professor of microbiology and cell science with the University of Florida Institute of Food and Agricultural Sciences (UF/IFAS), will help an investigation in which researchers take the best genes from one plant and transfer them into another. With that combination, Wang and the research team believe they’ll move closer to growers’ goal of citrus that copes better with greening. Scientists from the University of California-Davis are leading the $4 million project, which is being funded by the Specialty Crop Research Initiative, part of the National Institute of Food and Agriculture, an arm of the U.S. Department of Agriculture. Wang is one of several investigators on the project. Wang wants to inhibit the spread of Candidatus Liberibacter asiaticus — the bacterium that causes greening — by boosting citrus immunity. This proposed research will develop HLB control therapies and generate disease-resistant varieties, he said. Additionally, Wang’s research will further help citrus breeders identify the genes they need to develop greening-tolerant varieties faster.